During a recent visit from an old friend, one of my habitual behaviors earned me an odd look and a question. “Did you just eat a spoonful of coconut oil? Raw! ?” Well, yes. I certainly did. But for me, eating coconut oil straight from the jar isn’t even something I think about anymore. I just do it. If you’ve never tried it, you should. Eating a spoonful or two of straight coconut oil every day is actually more pleasant than it might sound. In fact, the benefits to your overall health and well-being are many. And, for the most part, they have solid scientific research to back them up. As far as quantities go, 2 – 4 tablespoons is the recommended daily amount. However, you may want to start out with just 1 spoonful to see how you like it. As previously mentioned, the list of health benefits you’ll gain by eating coconut oil is a long one. So grab a jar or two, pick up a spoon and get ready to dig in. Because I’m about to give you 23 of the biggest, boldest and most impressive ways that this simple daily practice can (and probably will) change your life. When you’re trying to shed those unwanted pounds, coconut oil can help speed up the process. There are a few reasons that this works. Eating coconut oil boosts your metabolism, giving you more energy throughout the day. Additionally, because coconut oil provides the body with clean and easily-obtainable energy, you’ll feel less hungry after you eat it. It can also improve your digestion and increase your ability to absorb nutrients from the food you eat. As a result, you’ll also experience fewer unhealthy ‘junk’ food cravings. Furthermore, eating coconut oil helps to balance hormones. This means less stress and, consequently, less of the ‘stress hormones’ which cause fat retention – especially around the midsection! Check out these 6 Genius Ways Coconut Oil Helps You Lose Weight to get all of the details. In addition to facilitating weight-loss, coconut oil provides long-lasting energy. As such, eating a spoonful of coconut oil before heading to the gym can help get you through that difficult workout. Not only will you experience increased endurance, but you’ll also get better blood flow to your muscles. It’s a winning combination! Cutting back on ‘junk’ food doesn’t just help you to lose weight. It also improves many other aspects of your health. Just a few of these include balanced blood-sugar, blood-pressure and cholesterol levels; healthier hormone production; more efficient liver and kidney function; improved mental capabilities; and a cleaner complexion. As previously mentioned, eating coconut oil helps to curb unhealthy cravings naturally. It does this by improving digestion and nutrient absorption, as well as by boosting metabolism and energy levels. Of course, eating coconut oil is just one way to do this. Read up on these 12 Genius Tricks To Curb Cravings Naturally to learn more! We already mentioned that eating coconut oil is a great way to improve your digestion. This effect happens for several reasons. First, coconut oil helps eliminate overgrowth of harmful bacteria and other microbes which may be present in your digestive tract. These parasitic microorganisms are a leading cause of poor digestion – a condition which can seriously damage many other aspects of your health. Additionally, coconut oil facilitates better absorption of the vitamins and minerals in other foods you eat. Some notable examples are calcium and magnesium, as well as fat-soluble vitamins A and E.
Eating coconut oil also reduces inflammation in the gut which may be caused by food sensitivities or other dietary problems. If left untreated, this inflammation can lead to more serious digestive disorders such as nutrient deficiencies or Leaky Gut Syndrome. Because it improves digestion and balances blood-sugar levels, eating coconut oil also helps to regulate appetite. It provides concentrated energy which is easy for the body to digest and use. Thus you’ll feel fuller longer after you eat it; and you won’t need snacks or meals nearly as often. Eating a spoonful of coconut oil straight from the jar first thing in the morning not only kick-starts your metabolism. It’s also a great way to wake up your mind. Furthermore, regular use of coconut oil in your diet actually improves memory. This is thought to be due to the medium-chain triglycerides (MCTs) which make up over half of the essential fatty acid content of coconut oil. MCTs provide easily-accessible energy to the brain just as they do to the rest of the body. The result is overall better cognitive ability – both short- and long-term. Because of its positive effects on the brain, coconut oil can also help ward off neurodegenerative disorders like Alzheimer’s Disease. It does this by providing the brain with an alternate source of fuel – chemicals known as ketones which are produced by our bodies when we eat coconut oil. These ketones are easily-accessible even for brain cells which have lost the ability to process glucose, one of the leading causes of Alzheimer’s. Many neurodegenerative disorders develop slowly over time and only become apparent later in life. So getting into the daily habit of eating coconut oil now just might save your mind further down the line! Most people don’t drink enough water. This results in a constant state of dehydration which can easily lead to bacterial infection in the urinary tract (also known as a UTI). Of course, our first and best piece of advice would be to simply drink more water. But eating coconut oil straight from the jar is also an effective natural remedy to prevent or treat a UTI. Coconut oil is a powerful natural antibiotic. The MCTs which make up the majority of the oil actually penetrate and dissolve the cellular wall of harmful bacteria. In effect, this causes them to disintegrate and die. Coconut oil is just one of many natural antibiotic foods. Learn more about this and 11 others in this article. Bad breath is most often caused by bacteria which naturally exist in the mouth. Because of its powerful anti-microbial properties, this also makes coconut oil ideal for freshening breath. Maximize your coconut oil’s contact with buccal bacteria by swishing the oil around your mouth for about 30 seconds. Then you can either spit the oil out or swallow it, depending on your personal preference. Those same bacteria which cause bad breath, secrete a stick substance (which we call plaque) in order to hold on to whatever surface they’re growing upon. Bacterial plaque not only holds bacteria in place, it also adheres food particles to your teeth. This lingering food is a leading cause of staining. When you use coconut oil to remove excess bacteria, you also reduce plaque build-up and prevent much of this staining. Thus eating coconut oil can go a long way toward keeping your pearly-whites bright and healthy! Plus pick up a few more tips to naturally whiten your teeth in this great article! When you eat a spoonful of coconut oil straight from the jar, you’ll automatically run your lips over the surface of the utensil as you slide it out of your mouth. This action doubles as a natural way to moisturize and nourish your lips. Even if they aren’t dry, your lips will benefit from this extra dose of pure lipid perfection! That said, if you get a bad case of dry-mouth, try drinking about 4 ounces of water to start the re-hydration process. Then chase it with a spoonful of coconut oil. As the oil moves through your mouth and throat, it will help to seal in what moisture is there and alleviate the uncomfortable symptoms of dry-mouth. Continue to drink 3 – 4 ounces of water every 30 minutes or so until your body becomes re-hydrated. At this point, your dry mouth symptoms should fade completely. This seems to work in much the same way as using coconut oil for dry-mouth. To soothe a dry, scratchy throat, drink a small glass of water. Then follow that with a spoonful of coconut oil to seal in moisture. The anti-inflammatory properties of the oil will also help to alleviate any swelling or irritation in your throat. Remember, when you’re trying to re-hydrate your body, you’ll need to drink a little bit of water at a time. On average, try to consume between 3 – 4 ounces (or 90 – 120 ml) of water per hour. You can drink more water and do it more frequently, if you so desire. Just remember not to drink too fast as this could actually upset your stomach, in some cases. As mentioned earlier, the medium-chain triglycerides (MCTs) in coconut oil behave differently than other saturated (long-chain) fats. 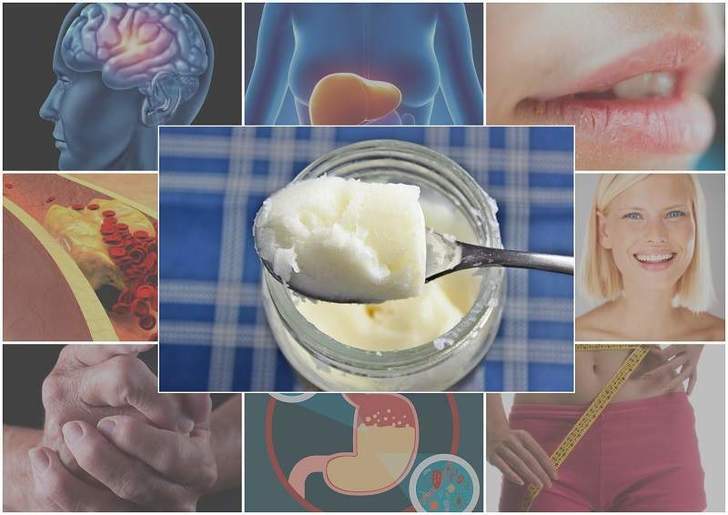 Whereas most saturated fats must be broken down in the intestines before being transported into the bloodstream for use as fuel; the MCTs in coconut oil are absorbed as-is and delivered directly to the liver. The liver then transforms these intact fatty acids directly into energy, thus reducing its already considerable workload. Furthermore, because the liver directly converts MCTs into energy, eating coconut oil also results in less fat accumulation (stored energy from other sources) in and around the liver. Working side-by-side with the liver, the pancreas also benefits when we eat coconut oil. One of the pancreas’ functions is to produce the enzymes needed to transform fatty acids into usable energy. Because its MCTs don’t have to be broken down this way, eating coconut oil also reduces strain on the pancreas by lightening its workload. Insulin resistance (the precursor to Type 2 Diabetes) results when the bloodstream is constantly flooded with high concentrations of glucose (also known as high blood-sugar). This over-abundance of glucose signals the pancreas to increase production of insulin, the hormone responsible for regulating blood-sugar levels. Eventually, over-production of insulin in the blood stream causes cells throughout the body to become desensitized to the presence of this vital hormone. So how does coconut oil help prevent insulin resistance? Again, it’s the high concentration of MCTs – or more specifically, the ketones which are produced as a result of eating coconut oil. Think of ketones as anti-glucose. They provide the same energy to our cells; however, they don’t require insulin to do so. The less insulin we need, the less likely we are to become resistant to it. Lauric acid – the main MCT in coconut oil – is known for its ability to naturally increase HDL “good” cholesterol. It also has the effect of transforming LDL “bad” cholesterol into even more “good” cholesterol. As the ratio of HDL to LDL increases, cardiovascular health improves, lowering the risk of all forms of heart disease. Furthermore, virgin coconut oil (which is the only kind you should be eating) is full of antioxidants which can help to prevent oxidative damage to arteries. This further cardiovascular health by reducing the formation of arterial plaques – the calcified blockages which lead to atherosclerosis (arterial hardening) and eventually cause heart attacks and strokes. Learn more about coconut oil as well as 20 other foods which naturally unclog arteries in this article. Eating coconut oil straight from the jar can actually help to treat and heal arthritis. This is due in part to the powerful anti-inflammatory nature of the fatty acids and antioxidants found in the oil. Also, coconut oil increases absorption of fat-soluble vitamins A and E, as well as minerals like calcium and magnesium; all of which are beneficial for maintaining strong bones and connective tissue. When we eat coconut oil, our bodies produce chemicals called ketones. These ketones provide energy to healthy cells throughout the body while neglecting cancerous cells. Without adequate energy to fuel their mutated growth rates, cancer cells are unable to replicate as fast. Not only that, but coconut oil is also able to kill Helicobacter pylori, a strain of bacteria commonly found in the upper digestive tract which is thought to be a cause of stomach cancer. The increased ketones produced by our bodies when we eat coconut oil have another pretty incredible effect. They are known to significantly reduce the frequency of seizures caused by drug-resistant epilepsy in children. This effect is achieved through eating coconut oil as part of a ketogenic diet. You can read more about it on the Epilepsy Foundation website here. In order to synthesize healthy hormones, our bodies require a variety of fatty acids – many of which coconut oil provides! Eating just a spoonful or two each day can significantly impact your hormone production. You’ll feel the results in the forms of reduced stress, better sleep, more energy and an over-all greater sense of well-being, just to name a few. Read more about coconut oil and 29 other foods that naturally balance hormones in this article. Body odor is caused by a combination of factors. Some of these include poor diet, stress and other hormonal imbalance, microbial overgrowth, and build-up of waste toxins due to poor liver and kidney function. Because coconut oil has such a huge positive impact on these aspects of your health, eating it on a daily basis can actually make your whole body smell better! At first mention, this may not seem like a noteworthy health benefit. However, your body’s natural scent actually plays a pretty major role in your life. If you’re interested, there are hundreds of scientific studies on the subject which you can find here. Coconut oil possesses several properties which make it perfect for maintaining optimum skin, hair and nail health. The fatty acids naturally present in coconut oil nourish and moisturize from the inside out. Not only that, but these same fats increase your body’s ability to absorb vitamins A and E, which are essential for skin, hair and nail health growth. 23. It Will Make Your Coat Soft & Shiny! Okay, so obviously this one isn’t about you or me. However, after detailing all of the good things that happen to your body when you eat coconut oil straight from the jar; it seemed prudent to point out that the same goes for your pets. By rubbing it into their fur, it can help clear up problems like dermatitis, general itching, and flea allergies while improving the health of your animal’s skin. Your pet’s coat will be sleek and glossy, and it will smell better too. It promotes the healing of wounds, dry skin, bites, and stings, as well as preventing or treating yeast and fungal infections. Coconut oil can even protect Fido against ticks and fleas. Studies have shown that coconut oil is well tolerated, even in toxicity studies where the researchers fed large amounts of coconut oil to animals. The worst that might happen if your pet somehow ate an entire jar of the stuff is that he’d end up with a bout of diarrhea – and, you’d have a mess on your hands. Head on over to 10 Ways to Use Coconut Oil To Improve Your Dogs (& Other Pets) Health to learn more. And don’t worry about trying to coax them to eat it. Most pets (even very spoiled and finicky eaters…) need very little convincing if any at all! When purchasing coconut oil, it’s important to opt for cold-pressed, unrefined, virgin coconut oil that has been ethically sourced. If buying from Amazon, then this jar of Nutiva Organic Virgin Coconut Oil is one of the most popular and meets all of the above criteria. Alternatively, you can claim a free jar of Thrive Market Organic Virgin Coconut Oil from here on Thrive Market with a $29 purchase.